The Library will be closed Monday, January 15th for Martin Luther King, Jr. Day. A half hour program to introduce children Birth to 2 to books and the library using rhymes, songs, and simple stories. Please pick up a token in The Children's Room for each attendee before entering the Activity Room. Make Way for Toddlers is a story time for children ages 2 and 3 with their favorite adult. each attendee in the Children's Room before coming to the Activity Room. The Junior Friends of Memorial Hall Library is a volunteer library program for ages 8-11.
more information, please contact librarian Kate Belczyk, 978-623-8440, kbelczyk@mhl.org. before going into the Activity Room. We will explore different languages through songs, rhymes, stories and games. Whether you are a native speaker who would like to meet other parents in the community who raise their children bilingually, or you would like to expose your child to different languages and cultures at an early age, join us for this fun event. Join us for a story time for preschoolers and their families (including a craft). After stories enjoy donut holes, coffee and juice. No registration but please pick up a token for each person attending in the Children's Room. www.mhl.org startin April 13th at 9:00 a.m., space is limited. Not your average yoga class! A lively form of yoga that involves child friendly yoga poses, games, stories, songs and mini relaxation to end the class. Perfect for littles who aren't quite ready to sit still for long periods of time and need to get their wiggles out. Teaches breathing techniques and stretching. Space is limited so please sign up online the Family name and the number of children and adults attending. Thank you to The Friends of Memorial Hall Library for sponsoring this special event! Star Readers book discussion club is for kids ages 8-12. Please register the child's name and request the book and read it before attending. We'll also have other book suggestions to keep you reading all year long! This month we are reading Heidi by Johanna Spyri and we'll have a guest from Switzerland visit and talk about her country. Annie is back!! Annie is a gorgeous therapy dog who loves to be read to by children! Annie is planning to visit us a lot over the next few months. She loves to sit and listen to children who are able to read on their own and may need a little bit of practice with their new skill. Annie will meet with (four) different children each time she visits for a period of 15 minutes with each child. Please arrive 10 minutes before your time slot so you can pick out a book to read to Annie. Also, please note that only the child who is reading to Annie is allowed in the room during the session. Please register online the name of the child who will be reading to Annie. evening craft program with Miss Kate. No registration required. Library for some springtime games and crafts. No registration required. A half hour program to introduce children Birth to 2 to books and the library using rhymes, songs, and simple stories. No registration required. Bryson Lang, Cure for the Common Show! At Bryson’s comedy/juggling show you’ll see: flying sombreros, sharp sickles, huge spinning rings, upside down bounce-juggling, giant beach balls, glo-in-the-dark objects, a tennis racquet and always a few surprises. Some audience members will also join Bryson in the spotlight to add an extra dimension to the performance and bridge the gap between the stage and the crowd. Appropriate for families with children ages 3 and up! Please register the family name and how many adults/children will attend. Thank you to our sponsors The Friends of Memorial Hall Library! There are 118 spaces available. NEW! Preschoolers and their families are welcome to join us for a new program introducing the French language using rhymes, songs and simple stories! We are thrilled to have Miss Ashley, a parent from Montreal, who will present this program for us! It's like Wiggle Words but in French (with some English thrown in!). Please arrive early to pick up tokens for each attendee! April 24th at 9:00 a.m., at www.mhl.org, space is limited. In-Be-Tweens! If you're currently in Grades 4 or 5, join us as we create a beautiful floral card that you can give to someone special in your life! Please register online as space and supplies are limited. If you're currently in Grades 4 or 5 join us as we make something to celebrate Spring!. Please register online as space and supplies are limited. This book discussion program is geared to children between the ages of 9-12 (with a favorite adult)! Please register online the NAME OF THE CHILD ONLY who will be attending. Also, please request and read the book before the meeting. There will be a new book preview at the meeting too! 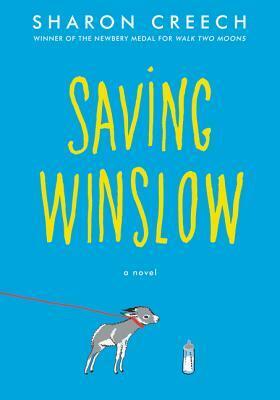 This month's Night Readers selection will be SAVING WINSLOW by Sharon Creech. "Louie doesn't have the best luck when it comes to nurturing small creatures. So when his father brings home a sickly newborn mini donkey, he's determined to save him. He names him Winslow. Taking care of him helps Louie feel closer to his brother, Gus, who is far, far away in the army. Everyone worries that Winslow won't survive, especially Louie’s quirky new friend, Nora, who has experienced loss of her own. But as Louie's bond with Winslow grows, surprising and life-altering events prove that this fragile donkey is stronger than anyone could have imagined." Peter Sheridan has been a children's musician for twenty years providing music to many libraries, daycare centers and schools in the area. He plays guitar, accordion, harmonica and an assortment of other instruments along with using puppets and books in his program. Peter has also been a featured children's performer at First Night celebrations in Portsmouth, NH for the past six years. The Andover Garden Club, in collaboration with the Memorial Hall Library Children's Room, will be hosting a book reading and related activities to learn more about nature and gardening. Children ages 4-8 should register online, space is limited. Parents welcome too! Come join in an hour of fun for the whole family...and maybe win a book too! We will play four to five rounds of Bingo and share lots of laughs while doing it! Family Book Bingo is open to everyone in your family. Please register online the name of each person who will be attending the program. Star Readers book discussion club is for kids ages 8-12. Please register the child's name and request the book and read it before attending. We'll also have other book suggestions to keep you reading all year long! This month's book will be James and the Giant Peach by Roald Dahl. Have you currently in Grades 3-5? Are you crazy about coloring? This is the program for you! There will be lots of coloring pages available for you to color with colored pencils, markers, and gel pens! Come color with us and let your creativity fly! Register online the name of the child who will be attending the program. This special program is geared to children between the ages of 4-5 and a favorite adult. Join Miss Kim as she reads a brand-new picture book from the Children's collection. There will be a fun activity to go along with the story too! Please register online the name of the child only who will be attending. register at www.mhl.org, starting May 9th at 9:00 a.m., space is limited. reading and related activities to learn more about nature and gardening. Children ages 4-7 should register online, space is limited. Super Readers book discussion club is for kids ages 8-12. Please register the child's name and request the book and read it before attending. We'll also have other book suggestions to keep you reading all year long! Each book will be chosen at the previous month's meeting so check back for this month's title. Preschoolers to age 5 can "play" at different stations with activities related to a theme and books. Join us as we get ready for Summer! Space is limited so please register the child's name and one adult.